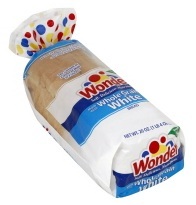 Wheat: Enriched Wheat Flour (Flour, Barley Malt), Whole Wheat Flour, Wheat Gluten, Wheat Starch. Soy: Soy Fiber, Soy Flour, Soy Lecithin. Gluten Grains: Enriched Wheat Flour (Flour, Barley Malt), Whole Wheat Flour, Wheat Gluten, Wheat Starch. Refined Sweeteners: High Fructose Corn Syrup or Sugar, Honey. Chemical Additives: Enriched Wheat Flour (Ferrous Sulfate [Iron], B Vitamins [Niacin, Thiamine Mononitrate (B1), Riboflavin (B2), Folic Acid]), Calcium Sulfate, Dough Conditioners (Sodium Stearoyl Lactylate, DATEM, Mono and Diglycerides, Ethoxylated Mono and Diglycerides, Dicalcium Phosphate, Calcium Dioxide and/or Azodicarbonamide), Yeast Nutrients (Ammonium Sulfate, Ammonium Chloride, Monocalcium Phosphate and/or Ammonium Phosphate), Enrichment (Vitamin E Acetate, Ferrous Sulfate [Iron], Zinc Oxide, Calcium Sulfate, Niacin, Vitamin D, Pyridoxine Hydrochloride [B6], Folic Acid, Thiamine Mononitrate [B1] and Vitamin B-12), Calcium Propionate (to Retain Freshness). High Omega-6 Oils: Soybean Oil. From the ingredients list above, you can see that this product has six of the seven deadly foods. Energy-Dense Ingredients: High Fructose Corn Syrup or Sugar, Honey, wheat flour. Final Thoughts: You never really know how devoid of nutrients refined wheat fours are until you start looking at ingredients lists. Look at all the vitamins and minerals that have been added to this bread: Iron, niacin, thiamine, riboflavin, folic acid, and vitamins B1, B6, B12, D, and E. If you want a nutritious food full of natural vitamins and minerals, try a grilled steak (with butter and garlic), with a side of mashed potatoes (with heavy cream and butter), and steamed vegetables.